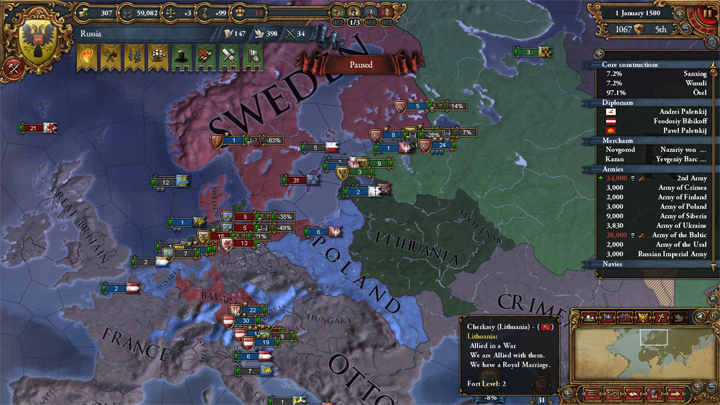 It wasn’t my idea, but Denmark calls me into war against Sweden in 1530. Normally, I’d want to stay out of European entanglements, but Sweden rivaled me a long time ago, so I want to hurt them. Maybe I can pick up some more territory near Finland. But as is par for this series, Denmark ends the war in 1533 before I can make my own separate peace and swipe some territory. And that war was tough. I may be ahead of time when it comes to Military Tech, but I’m still in the Eastern technology group. Surprisingly, the Swedes didn’t just let me take their territory. It was very rude of them. A few years later all that stuff about trying to steal provinces from Sweden is just water under the bridge. I ally with them and then go to war with the Golden Horde. 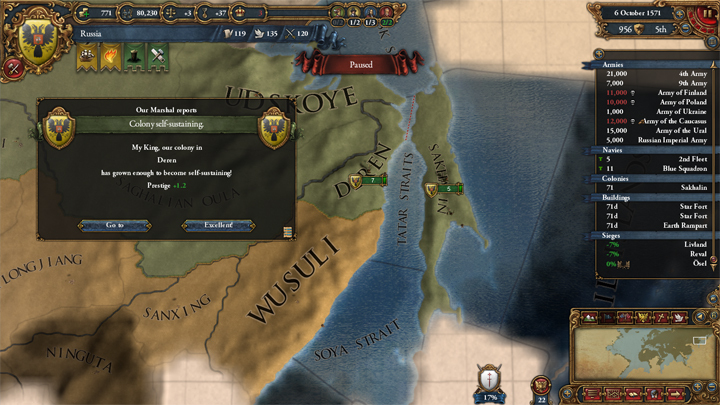 I only end up with 1 province, but you know what they say: a province in the bush is worth two in the hand. Or something like that. 1539 Sweden asks for my help against–I actually don’t remember. Probably the Hansa, Pomerania, and that monstrous Austria. I want no part of it. Later, Sweden! You’re on your own now. The war ends up being something of a stalemate. Sweden has basically eaten all of Norway (except for Iceland) and Denmark, so they’re gonna be fine without my help. By the 1550s I’ve settled into a pattern: years of peace and growth followed by quick wars against my eastern neighbors. I’m worried about Crimea who has eaten the southern part of the Golden Horde, parts of Lithuania, as well as Georgia and Genoa’s Black Sea holdings. Money’s still an issue for me as my economy can barely support 3 colonies at a time, but I keep doing it anyway. 1563: I bite the bullet and hit the button to westernize. I have a good king, vast reserves of gold and Admin Points to buy back the -3 Stability hit, and I have good advisors too. It’ll be a while before I have to fire them to get rid of their upkeep. There’s a few revolts in the beginning, but everything is going well. The process says it’ll be done in 1570. 7 years? I can wait. Just have to not go to war and just keep everything stable. Every event I get I take the hits to my tax revenues, army and naval traditions, you name it. I don’t want to lose any progress in the westernization process. It can all be recovered once its done. And then in 1566: mission accomplished! While my kingdom is looking to the west for technological guidance, my settlers have planted my flag on the shores of the Pacific Ocean! Technically, the colony will be self-sustaining by 1571, but it doesn’t matter! I did it! The clock rolls over to 1570 and boom! I’m westernized. What to do with my new-found technology? Attack Manchu of course! 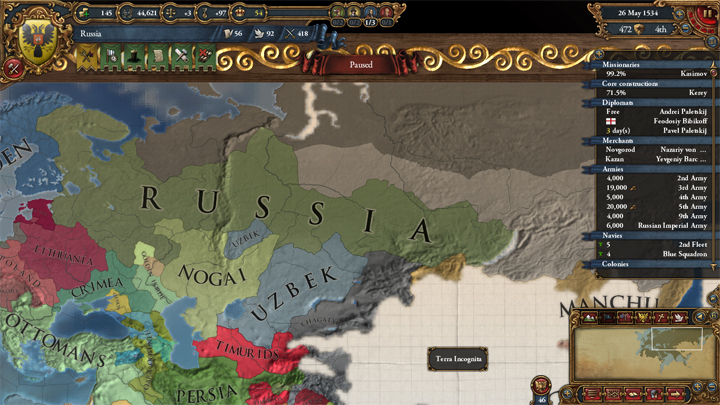 1579 sees 3 provinces added to my realm. I think I’ll build up a presence in the Beijing trade node. 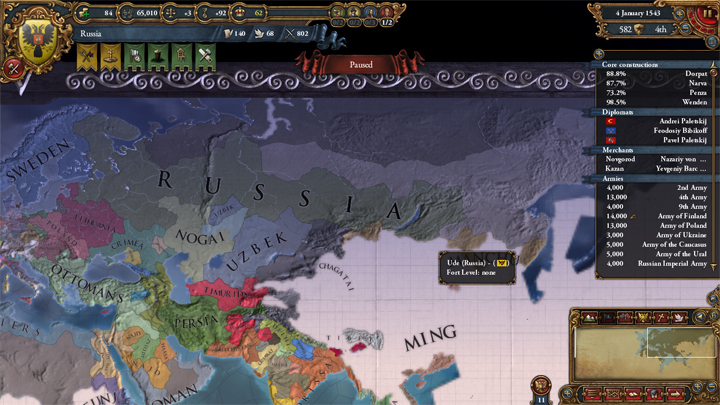 That will give me control of the Novgorod and eventually the Beijing nodes. 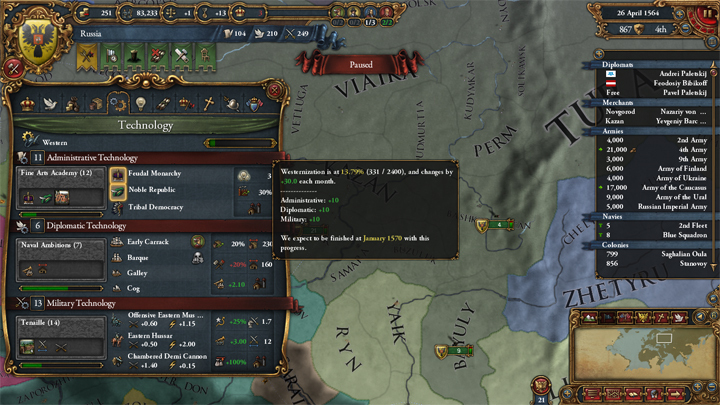 In 1580 Lithuania calls me to war against Lunberg, the Hansa, and some of their other allies. I figure it should be an easy war to say yes to and then basically do nothing. Maybe I’ll send a few regiments west. As soon as I hit that accept button I regret it: “Because of our superior strength, we’ve assumed control…” Well damn it. This is not what I wanted. The war goes badly (mostly because I refuse to help), so as soon as I get the chance, I surrender and give Mecklenburg to Lüneburg. No skin off my nose. Hell, Lithuania didn’t own it either. I keep my ally. Whatever; it’s fine. It’s not really a stab in Lithuania’s back. More like a scrape on their side or something. A medium-strength poke to the ribs. As we get closer to the 1600s the world looks different than I expected: Great Britain controls most of Brazil, Mexico, and according to flags on the trade nodes California. Castile’s holdings in the Iberian Peninsula are getting wrecked by Aragon, and Galicia is an independent kingdom. Crimea is rather large, and I don’t like that they’re so buddy buddy with the Ottomans. Wales is still independent, and Brittany might be too (I don’t remember exactly). I have a feeling Jolly Ol’ England (GB) and I will come to blows over some overseas provinces in the coming centuries. And that’s going to be it for Part 4. Check back here in a couple of days for Part 5! I have 2 or 3 more parts planned, but then I think I’m going to end the series for reasons that will be made clear in the future. I love EUIV, but this series isn’t something I want to stick with all the way to 1821.